Over the past week, two writers published columns in foreign newspapers. One received wall to wall coverage in Israel. The other was completely ignored. The contrasting fortunes of the articles are a key to understanding the central challenges to Israel's democratic order. So as far as the supposedly moderate chief Palestinian negotiator is concerned, a peace deal in which Israel cedes Judea and Samaria and Jerusalem to the Palestinians as the Israeli Left desires will not be sufficient for the Palestinians. Unless Israel also agrees to commit national suicide by accepting 7 million foreign Arabs as citizens, the Palestinians will continue to wage their war. With or without a Palestinian state, as long as Israel exists, the Palestinians will continue to seek its destruction. The second article was Tom Friedman's latest column in the New York Times. Throughout his interminable career, Friedman has identified with Israel's radical Left and so been the bane of all non-leftist governments. In his latest screed, he compared Prime Minister Binyamin Netanyahu to someone in the throes of an LSD trip. Friedman harangued Netanyahu for failing to convince his cabinet to agree to the Obama administration's demand to abrogate Jewish property rights in Judea, Samaria and Jerusalem for another 90 days. He argued that by doing so, Israel - with some help from the Palestinians - is destroying all chance of peace. So on the one hand, the chief Palestinian negotiator declared eternal war. And on the other hand, Friedman condemned Netanyahu - for the gazillionth time. And characteristically, the Israeli media ignored Erekat's article and gave Friedman's screed around-the-clock coverage. Despite its hysteria, the media has not fooled the public. The Israeli people don't need to hear about Erekat's declaration of war to know that the supposedly moderate Fatah party is just as committed to Israel's destruction as Hamas. Israelis know that the majority of terrorist attacks carried out by the Palestinians since 2000 have been conducted by Fatah. They know that the US- and EU-financed and trained Palestinian security services commanded the Palestinian jihad that began in 2000. They know that Fatah is behind much of the political warfare being carried out today against Israel throughout the world. The disparity between the pubic and the media comes across very clearly in a poll released last week by the Brookings Institute. A mere eight percent of Israelis believe that Israel and the Palestinians will achieve a lasting peace in the next five years. 91 percent of Israeli Jews and 88 percent of Israeli Arabs think either that more time is needed or that there will never be peace. Despite the sentiments of the public, there is a class of Israeli leaders that acts as though peace is just around the corner and that the public expects them to deliver it. Not unlike Friedman, for the most part these politicians argue that the Israeli government bears either sole responsibility or the lion's share of responsibility for the absence of peace. Consequently, they argue that all that is required to achieve peace is an Israeli leader willing to do what it takes to make it happen. Over the weekend, opposition leader Tzipi Livni and Defense Minister and Labor Party leader Ehud Barak were in Washington for the annual Middle East peace process conclave at the Brookings Institute's Saban Forum. In their addresses to the forum and in media interviews, both politicians followed the Israeli media's lead by ignoring Erekat and parroting Friedman. Barak brazenly rejected the policies of the government he serves by calling for the division of Jerusalem in the framework of a final peace accord with the Palesstinians. As for Livni, she eschewed every semblance of propriety during her stay in the US capital. 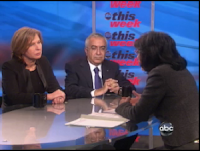 During a joint appearance on ABC's "This Week," with the unelected Palestinian prime minister Salam Fayyad, Livni viciously attacked the Netanyahu government. Livni criticized Netanyahu for not accepting the Obama administration's call to abrogate Jewish property rights. She attacked him for not forming a leftist government with Kadima and Labor. She made it clear that she doesn't believe that Netanyahu is interested in peace. Echoing Barak's assertion at the Saban Forum that being a Zionist means supporting a Palestinian state, Livni argued that by surrendering to the Palestinians, and agreeing to every US demand, Israel is advancing its own existential interests. On the so-called Palestinian refugee issue, while stipulating that Israel could not accept immigration of foreign Arabs to its truncated borders, she said nothing about Erekat's Guardian article. And she voiced no objection when Fayyad intimated that a Palestinian compromise on this issue is not in the offing. From Livni's perspective, the only one acting in bad faith is Netanyahu. Barak and Livni's behavior was not wrong simply because it is classless to attack your country's elected leadership while visiting in foreign lands. It was wrong because in behaving as they did, they showed extraordinary disrespect for the 92 percent of Israelis who do not share their professed belief that peace is just around the corner. So what were they after in Washington? Why did they embrace the views of a mere 8 percent of the electorate while treating 92 percent of their countrymen with contempt? And why did they choose to launch their assault on the government from Washington? In truth Barak and Livni were simply following what has become the standard operating procedure for leftist politicians over the past twenty years. They were playing to two constituencies that they prize more than they prize the public. They were playing to the US administration and the Israeli media. Barak is an old hand at this game. During Netanyahu's first tenure as prime minister, Barak used then president Bill Clinton to bring down Netanyahu's government and get himself elected in his place. After Barak made clear that he would be far more accommodating towards Yassir Arafat than Netanyahu was, Clinton went out of his way to demonize and isolate Netanyahu. He pressured Netanyahu's coalition partners to abandon his government. And when Netanyahu's government finally fell, Clinton dispatched his senior political strategists James Carville, Stanley Greenberg and Robert Schrum to run Barak's campaign. Since Netanyahu appointed him Defense Minister, Barak has been racking up frequent flier miles on the Tel-Aviv-Washington line. Barak travels to Washington at least once a month. Amazingly, he always happens to come home with recommendations consonant with the administration's whims. Livni was similarly richly rewarded for her willingness to attack Netanyahu while sitting next to Fayyad on American television. Secretary of State Hillary Clinton treated Livni like the most esteemed politician in Israel. Clinton steadfastly ignored the fact that 91 percent of Israelis think Livni's views are utter nonsense. And after accusing Netanyahu of lacking the courage to embrace the cause of peace, Clinton ostentatiously hosted Livni for an hour-long private meeting. Livni's party Kadima is a media creation. Whereas every other political party in Israel was formed by citizens who felt they needed to organize politically to empower their voices, Kadima was the brainchild of the media. The media colluded with Likud leaders who were disenchanted with their voters. The likes of Ha'aretz, Yediot Ahronot and Channel Two convinced these Likud politicians to join forces with breakaways from the Labor party, who also held their voters in contempt. As Barak's rise to power in 1999 makes clear, the media's bid to demonize the Right and undermine Israel's alliance with the US in the hopes of restoring the Left to power is nothing new. But this week, a leading media siren was kind enough to expose the media's entire strategy for disenfranchising the public. Ha'aretz's veteran columnist Akiva Eldar performed this service in a pair of articles published Tuesday in the Guardian and Ha'aretz. Eldar co-authored his Guardian article with his comrade Carlo Strenger. It was their response to Erekat's declaration of eternal war. Eldar's main message to Erekat was that he should keep his plans to himself. Certainly he shouldn't be blabbing about them in a place the Israeli public was liable to see them. It could wreck the media's entire plan to discredit the government. "Erekat's article is disappointing. He is not just a private citizen, but the Palestinian Authority's chief negotiator, and he knows Israel and its internal dynamics very well. He knows that raising the right of return at this moment plays into the hands of Israel's right wing: they will be able to say: 'We always told you so: the two-state solution is just a Palestinian plot to incorporate the Jewish state into the Greater State of Palestine.'" But then again, as Eldar showed in his article in Ha'aretz, Erekat doesn't really have anything to worry about. Eldar and his comrades will keep the Israeli public in the dark about Erekat's determination to destroy Israel. Ignoring completely what Erekat wrote, Eldar's column in Ha'aretz started where Friedman's ended. He placed all the blame for the absence of a peace process on Netanyahu's shoulders. He accused Netanyahu of destroying Israel's alliance with the US by not embracing Obama's latest request to abrogate Jewish property rights in Judea, Samaria and Jerusalem. He then claimed that due to Netanyahu's behavior, the Obama administration has decided to follow in the Clinton administration's footsteps and overthrow his government. "When Clinton recently invited Kadima leader Tzipi Livni to a private meeting, this signified an unofficial announcement that Netanyahu's account in Washington has been closed." "Twelve years ago, when Hillary Clinton's husband realized that... [Netanyahu] had no intention of honoring his signature (on the Wye River Accord with Yasser Arafat), that was Netanyahu's last stop before being sent back to his villa in Caesarea." So this is the game. The media and the US administration are again colluding with the Israeli Left's political leadership to overthrow the Netanyahu government. They are willfully ignoring both the will of Israel's voters and the declared commitment of their favorite "moderate" Palestinians to fight Israel until it is destroyed in order to blame the absence of peace on Netanyahu. This game can stop. But two things must happen first. The Obama administration and the US foreign policy establishment that supports it must pay a price for seeking to undermine the elected government of the US's most important strategic ally in the region. And Israeli voters - who gave Kadima more mandates in the Knesset than any other party in the last elections - must abandon Livni and her Astroturf party. Until these things begin to happen we can expect our media to continue to collude with their American partners, and with Livni and Barak to undermine the will of the public.